After the scintillating opening Rolex 24 in late January, now this week see’s the WeatherTech Sportscar championship roar back into life with another premiere event, the Mobil 1 Sebring 12 Hours from Florida. The event is one of the historic sportscar classics and this year promises to be a stunning race. If Daytona is anything to go by the 12 hours will be filled with intense and close fought racing that should keep the fans on the edge of their seats for the entire race. In the first of my previews of the event I’ll take a look at the Prototype class entry list, which features 12 cars filled with some of the biggest sportscar drivers in the world. Let’s take a look at the contenders. The DeltaWing team will be looking for a return on the tremendous promise they showed in the early running of the Rolex 24 in January. The car led the race for a period on genuine pace alone and was running highly when it tripped over a Prototype Challenge car in the middle of the evening. If the team can replicate it’s pace at Sebring this week and stay out of trouble they could very well challenge for the podium at least if not win the race. The Panoz team are highly experienced and their driver line up of Katherine Legge, Andy Meyrick and Sean Rayhall are more than quick enough to keep this car at the front of the race throughout the 12 hours. The Tequila Patron ESM team will be still on a high from their momentous victory in the Rolex 24 six weeks ago. The team drove the perfect race and the Ligier LMP2 prototype proved itself to be the fastest car on the grid for the majority of the race. Now at Sebring they will be looking for a repeat result, but the notoriously bumpy Sebring circuit is vastly different from Daytona. Overall downforce is more important here and that should favour the LMP2 cars, such as the ESM Ligier. On the driving front Pipo Derani announced himself as one of the best young prototype racers in the world with his performance at Daytona. He will once again be ably supported by experienced team mates Ed Brown, Scott Sharp and Johannes van Overbeek. This car will be considered one of the favourites for victory in this weeks build up to the race. The Action Express team will be hoping to bounce back with their #5 entry after a disappointing Rolex 24 by their standards. The #5 Mustang Sampling car finished fourth after some late car issues in the final portion of the race. This time around the team will be hoping they can return to winning ways, as they look to get themselves off to the best possible start in the championship. The teams driver line up of Joao Barbosa, Christian Fittipaldi and Filipe Albuquerque is one of the best line up’s in the class, something the team will look to exploit as they go in search of at least a podium place this weekend. For the Wayne Taylor team, the Rolex 24 was once again a case of close, but no cigar as they took up their almost customary position now of a close second at Daytona. The team were the fastest Daytona Prototype entry and were one of the few DP teams who looked to be able to take the fight to the ESM team. This weekend they will be looking to go one better, although another podium place would set them up perfectly for a good championship run in 2016. On the driving front the team have retained Rubens Barrichello after his late call up in Daytona, as Jordan Taylor still looks to recover fully from a nasty illness that has plagued his off-season preparation. Anything is possible for this team, as they look to avenge their Rolex defeat here at Sebring. The Alegra motorsport team make their WeatherTech debut this weekend at Sebring, with their older style Riley-BMW DP. They are an ambitious team and have been testing at the circuit to build their knowledge, although the team lacks significant experience compared to their competition. The team have employed Dominik Farnbacher, Daniel Morad, Carlos de Quesada and Cameron Lawrence to pilot the car, although the biggest knock on them is their lack of prototype racing experience. All four have extensive GT racing experience and have showed pace at that level, but with so many unknowns surrounding the team and the drivers lack of prototype experience predicting a result for this team is impossible. Anything more than a finish in the top ten would be a bonus and if the car and team can show potential that will be surely considered a good result for this team. The second Action Express racing entry was, much like it’s sister #5 entry, similarly affected by reliability issues late on in the Rolex 24. For the second round the #31 car will be looking to deliver on the pace they showed in Daytona. The team have their Corvette DP’s well sorted and will be hoping to show this in the end result. A podium would be a good result for the car championship wise, although at any chance of a win this car will be giving it everything. The huge experienced winner Scott Pruett joins this #31 car after racing for the #5 car at the Rolex 24, and this addition will only enhance their chance of victory come Saturday evening. The popular fifty plus racing team return after good showing at the opening Rolex 24. The team are never challenging for race victories, but that isn’t the main objective for this team. Their primary initive is to raise money for the Highway to Help charity, and once again they were able to raise awareness and money. The drivers will all be looking forward to running on the iconic Sebring circuit,as they focus more on enjoying themselves and raising money rather than focusing on going for an all out victory. If the attrition rate is high they have a chance of a good result, although they struggle to match the ultimate pace up front with the age of their Riley DP and their driver line up. The SpeedSource Mazda factory team struggled mightily in Daytona with engine reliability issues, attributed to their switch from Skyactiv diesel to a petrol engine. Both their two cars were retirements by the the halfway point. After this disappointing display the team will be hoping they can really test themselves at Sebring, a renowned car breaker of a circuit. The team and driver line up showed glimpses of potential when they ran at Daytona, and if they can stay reliable this entry has the real potential for a shock result. Once the reliability issues have been sorted, this team and their drivers have the top level quality to a win a prestigious race such as the Sebring 12 Hours. For Mike Shank, the Rolex 24 was a huge disappointment as they looked to be a serious challenger for victory when the engine failed on Saturday night. This time around at Sebring they will be hoping they can retain their pace from Daytona, and iron out the reliability issue with the new 3.5 litre Honda HPD engine. The Ligier-Honda combination will likely remain to be the fastest combination at Sebring, therefore Mike Shank racing will be looking to even up the honours after the ESM team won out at Daytona. Retaining Olivier Pla for Sebring is a huge step by the team and they have secured one of the fastest Ligier drivers on the planet to help their regular drivers John Pew and Ozz Negri Jr. This team will likely join the ESM team as being co-favourites before the start of the race. Much like with the #55 car, the #70 Lola-Mazda struggled mightily with reliability issues in Daytona. With six week to further test and develop the car the team will head into this weekend’s Sebring 12 Hours feeling more confident about the overall reliability of their package. This driver line up is high on experience and has a solid base with the majority of the drivers having a lot of experience with this Lola-Mazda. Completing the line up is the Japanese lady racer Keiko Ihara, who will bring some good sportscar experience to the SpeedSource team. She may need some time to adjust to both Sebring and the Lola-Mazda prototype, and this will ultimately be what decides if this entry can match it’s sister #55 car in terms of pace come race day. DragonSpeed make their debut in the WeatherTech series this weekend after missing the opening Rolex 24. The team has previous experience from racing in European GT categories such as the Blancpain Endurance Series. The team run by former racer Elton Julian have built a formidable line up with the very quick Frenchmen Nicolas Minassian and Nicolas Lapierre joining Henrik Hedman. The also have the only Oreca-Nissan package in the class, one which has proved very competitive both in the World Endurance Championship and European Le Mans Series. Although the team have tested at the circuit in the build up to the race, a lot is unknown surrounding this car as they have not run competitively in the series yet and it’s not known how the Oreca-Nissan package will compare with the benchmark Ligier-Honda teams. The VisitFlorida.com Spirit of Daytona racing team were another of the front running Daytona Prototype teams at the Rolex 24, finishing third and on the same lap as the winning ESM Ligier. They had a trouble free run at Daytona, they just lacked the last little edge in pace compared to the winning car. The team will be hoping they can at least get close to the leading Ligier entries this weekend, but if they can retain their reliability from the Rolex 24 they will be in with a chance of victory as they have enough quality with this driver line up and will have years of experience of how to perfectly set up their Corvette DP to absorb the bumps of Sebring. If any DP can topple the seeming Ligier dominance, this is one of the most likely teams to achieve this. That wraps up my Prototype class preview of this weekend’s Sebring 12 Hours, next up will be a look at the Prototype Challenge class. I would also like to say a huge thanks to IMSA.com and Motorsport.com for their invaluable help with the information and photographs that grace this article. I hope you enjoyed reading this preview and any comments would be greatly appreciated. Find me on Twitter @brfcjordan95. After the earlier Radical Clubman’s Cup race after the Formula Ford stanza, it was the turn of the premier UK Radical racing series, the SR3 Challenge, to take too the track. Despite a smaller than usual grid for this 90 minute endurance race the race still promised much excitement as some of Britain’s premier club Sportscar drivers took up their places on the starting grid. There was drama before the start however as rainfall over the back section of the circuit meant that one side was relatively dry whilst the other half was a completely wet circuit, leaving a massive headache for the drivers and teams before the start. It was the Peter Belshaw/Phil Keen car that took place with amateur driver Belshaw taking the start, with soloist Lewis Plato alongside him on the front row. 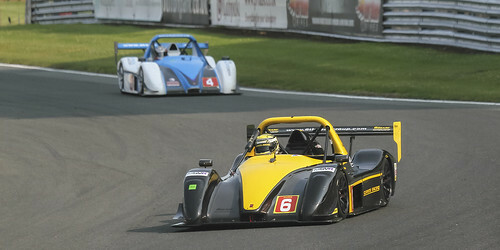 The Andy Cummings/Bradley Ellis SR3 took 3rd as ex-British GT champion Ellis took the start with another soloist Shahin Nouri completing row 2. From the start Bradley Ellis rocketed into an early lead as the rest of the field tip toed around the first laps on the greasy track. As Ellis and Lewis Plato shot away from the rest it appeared they may be on different tyres to the rest, such was their early advantage. By lap 7 it became clear tail enders Manhal Allos and Ossy Yusuf were the only one’s on wet tyres as they both set a string of Fastest laps, although their wet tyres would soon be destroyed by the rapidly drying conditions. By lap 17 it became clear the crossover point for dry tyres had been reached, as Ellis began setting a string of his own fastest laps to only extend his huge lead from the rest behind. The hopes of 3rd man Jasper Westerholm took an early hit as he was forced in for an unscheduled stop on lap 21 with a right rear puncture, dropping him well down the order. Between laps 25 and 30 the lead dice was hotting up as leader Ellis and Plato in 2nd began trading fastest laps between each other. On lap 32 the pit window opened for the cars in group A of the pit schedule, with 2nd man Plato and Peter Belshaw immediately taking advantage of this and pitting from their positions. The A group were all quick to pit in the subsequent laps although for the B group it took them a little longer to make their mandatory pitstop’s. Bradley Ellis was unsurprisingly the last to stop as on lap 42 as he handed over to his amateur team mate Andy Cummings with a significant lead of a lap and a bit over the rest. At this point of the race it was the Kevin Mills Radical SR3 of ex-single seater champion Scott Malvern who was setting the pace with very quick 1m04.2 lap times as he made up some ground lost in the first stint by co-driver Nick Jones. The impressive stint from Malvern didn’t last much longer sadly as he caused a Safety Car deployment on lap 47 to recover his car after crashing, although when later interviewed he explained a gear selection issue caused the off. The Safety Car was ill-timed for Cummings as he lost almost all his advantage as the rest made up their lap to him up front. Things quickly got even worse for Cummings as he was forced to pit for a stop/go penalty, only reducing his lead further as the Safety Car came in on lap 51. After his stop/go penalty allowed Lewis Plato into the lead of the race on lap 52, it was a tall order for amateur driver Cummings to keep up the professional drivers in the cars around him for the remainder of the race. A car off at Quarry necessitated another Safety Car on lap 56, although it’s very late deployment almost caught out the leading runners as they were forced to quickly slow down behind it. The Safety Car came in on lap 59, and Plato soon set about building a lead to the rest from the re-start. Ex-British GT and TVR Tuscan racer Phil Keen made light work of Cummings at the Esses to claim 2nd on lap 61, with a second penalty for Cummings effectively destroying his chances of a top 2 result as he was forced to pit again late on lap 66. The final laps provided a showdown finish as Keen began closing on Plato at the rate of 0.5 seconds per lap as he hunted for the win, with his first challenge for the lead coming at the Esses on the penultimate lap. The final laps were tense for the leading two although eventually Lewis Plato came home for victory by only 0.3 seconds from the Belshaw/Keen car after 90 minutes of flat out racing. 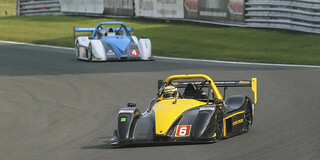 The greatly unlucky Ellis/Cummings car came home 3rd from a lapped Jesper Westerholm in 4th, with Manhal Allos and the Kim/Moseley cars completing the top 6 in an exciting endurance race from the Radical SR3 Challenge.